The term risk refers to the concept that an action or choice can result in a losing situation. The loss could be emotional, monetary, or otherwise. When the word "risk" is used it means that the concept of choice is involved. A teenager knows that she will be grounded if she chooses to invite friends over after school instead of doing her homework, but also knows that the likelihood of her parents finding out she did so is slight. If the teenager chooses to invite her friends over she is taking a risk of getting in trouble with her parents. A 55-year old man wants to quickly increase his retirement fund. In order to do so at a rapid pace, he must change his investments to those that could either yield higher results or completely fail, in which case he would lose his retirement. If the man chooses to move his investments to those in which he could possibly lose his money, he is a taking a risk. A gambler decides to take all of his winnings from the night and attempt a bet of "double or nothing." The gambler's choice is a risk in that he could lose all that he won in one bet. An employee knows that the time for him to leave work is contractually at 5 p.m. and leaving early puts his job in jeopardy. However, the man is motivated to get home early to let out his sick dog. By leaving early, the man is risking getting caught and facing the consequences of breaking the rules. 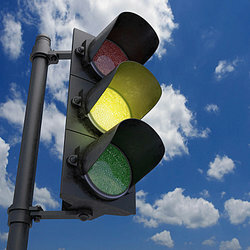 A driver is approaching a yellow light and must choose to brake in order to stop in time for the light to turn red or to accelerate to make it through the light before it turns red. If the driver accelerates, he is risking going through the light which could result in an accident or a ticket. A student in college knows that there is a curfew by which students are expected to be back on campus in the evening. However, the student wants to stay out later with the group she is with. If she chooses to stay out past the curfew time, she is risking experiencing the consequences for choosing not to follow the rules. A man lost his job and is unable to pay his rent. As a result, he makes the choice to steal money from the local convenience store. In doing so, he risks being caught and arrested. A woman gets into her car in the morning and notices that the gas level is low. She chooses to drive to work, regardless, without stopping at a gas station. By making this choice she is risking that she will run out of gas in her car on the way to work. A woman watches a man kidnap a child. In order to keep him from getting away from the scene of the crime, the woman jumps in front of the car. By doing this, she risked her life in order to save the child. Now you have seen lots of examples of risk and can better understand this important concept. "Examples of Risk." YourDictionary, n.d. Web. 18 April 2019. <https://examples.yourdictionary.com/examples-of-risk.html>.